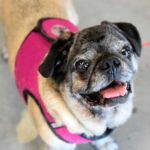 In March Pug Partners offered $50 off the adoption fee of any of our senior pugs. It was such a big success, we’re extending it for another month, and dropping the age of a “senior” to 8 instead of 9! Now through the end of April, you can adopt a senior pug at a reduced adoption fee. Seniors dogs make great companions and easily fit into the lifestyle of many families. They already know how to be a part of a pack, and are eager to join yours. There is no love and loyalty like that of a senior pug!